Eric Decker made a great one-handed catch between three Dolphins defenders on Sunday. New York Jets wide receiver Eric Decker was questionable for Sunday's game after injuring his knee in Week 2, but he's active and making plays. With just over 11 minutes left in the first half and the Jets leading 10-0 over the Miami Dolphins, Decker ran a deep route down the seam. Ryan Fitzpatrick saw his man running open and hit him in stride. The ball led Decker a little bit too much, but it was no issue for the wideout. Decker stuck his left hand out and hauled it in between three Dolphins defenders. His knee may not be 100 percent, but his left hand is. 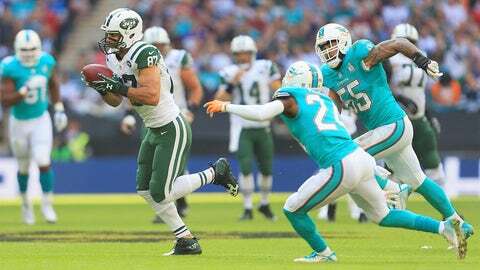 Decker made one of the best catches of the young season, and it led to a Jets field goal that put them up 13-0.